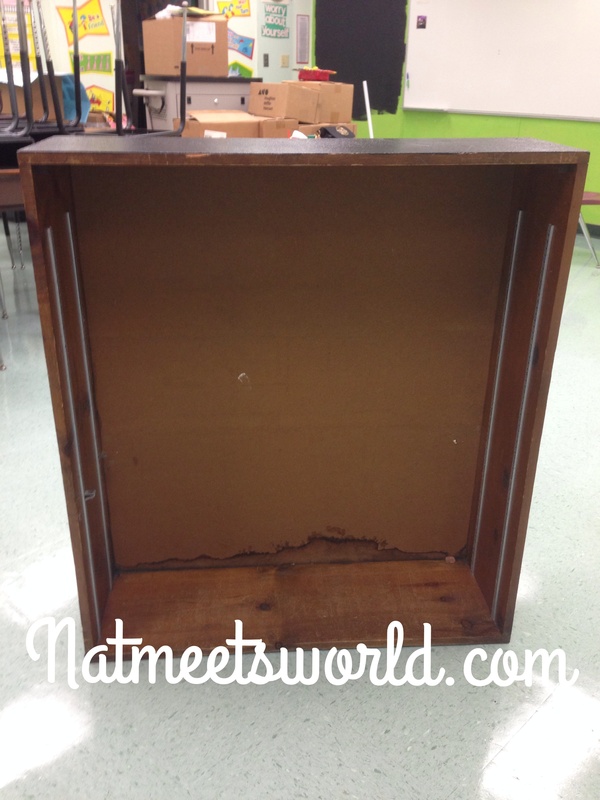 I always try to find new ways to brighten/liven my bedroom, home, or classroom. 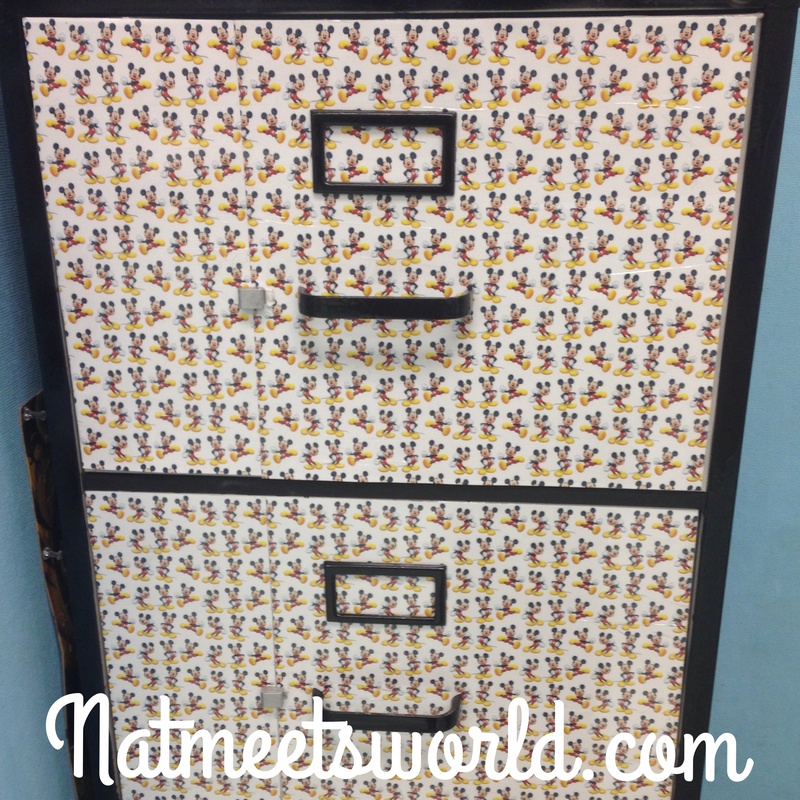 This summer, My best friend and I decided to turn our boring old bookshelves and filing cabinets into a piece of art! Furniture takes up most of the space in a room, so it is important to make it look great! 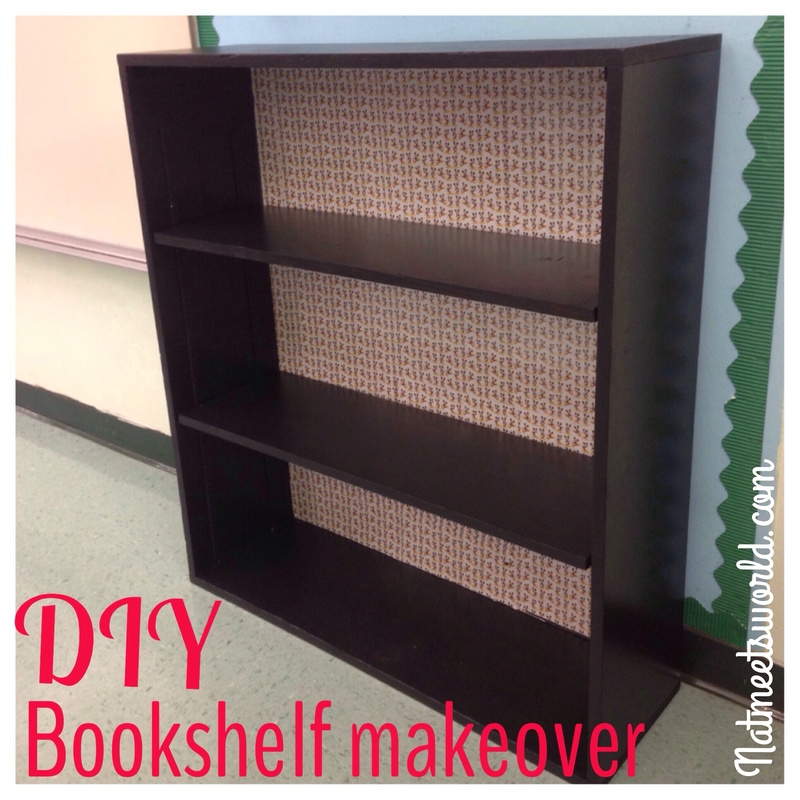 If you are interested in giving a makeover to your bookshelf or filing cabinet in your home office or classroom, check out my tutorial below! 1. Remove the shelves and wipe the entire bookshelf clean. I used baby wipes. Lightly ‘scrub’ the entire bookshelf (including the shelves) with sandpaper in a circular motion. This will allow the primer to adhere well. If you do not scrub the sandpaper lightly, your end result will be very rough and bumpy. 2. Use the primer paint as directed and make sure to prime the entire bookshelf and shelves. Let dry overnight. 3. Paint the bookshelf and shelves with your roller and color paint. You may need to paint 2 coats. Let dry completely. 4. 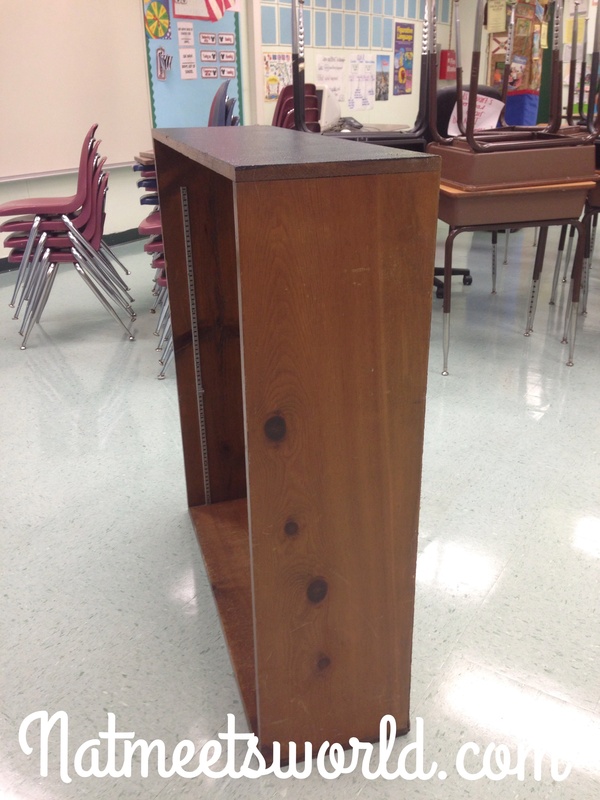 Lay your bookshelf on a flat service. Use the Krylon spray adhesive to spray a thin layer on the back of the bookshelf. Lightly and accurately lay the scrapbook paper down on the area where the adhesive was sprayed. You will notice that there may be some areas that the paper doesn’t reach (the picture above shows that both sides of the bookshelf are not covered). 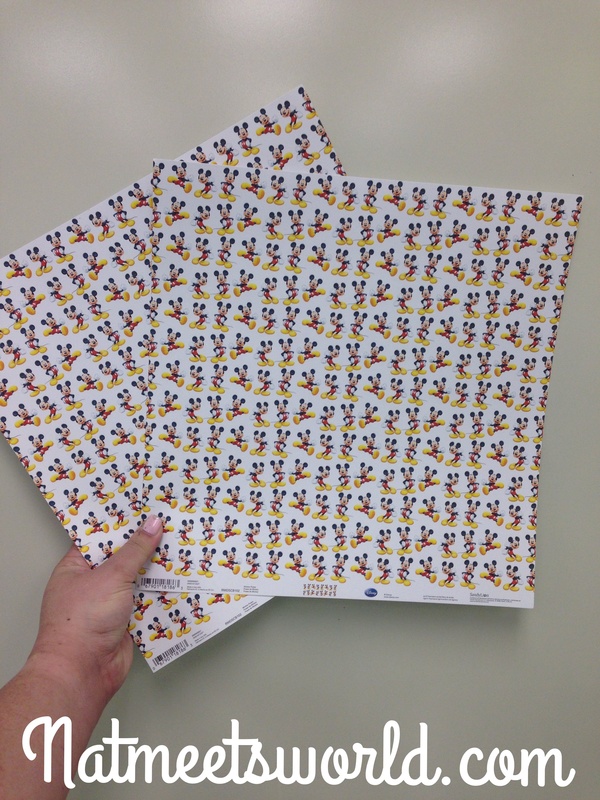 Measure the areas that need scrapbook paper and cut them before gluing them down. Repeat spraying the adhesive on the entire back of the bookshelf until it is completely covered. Once the entire back of the shelf is covered in scrapbook paper, let it dry over night. 5. 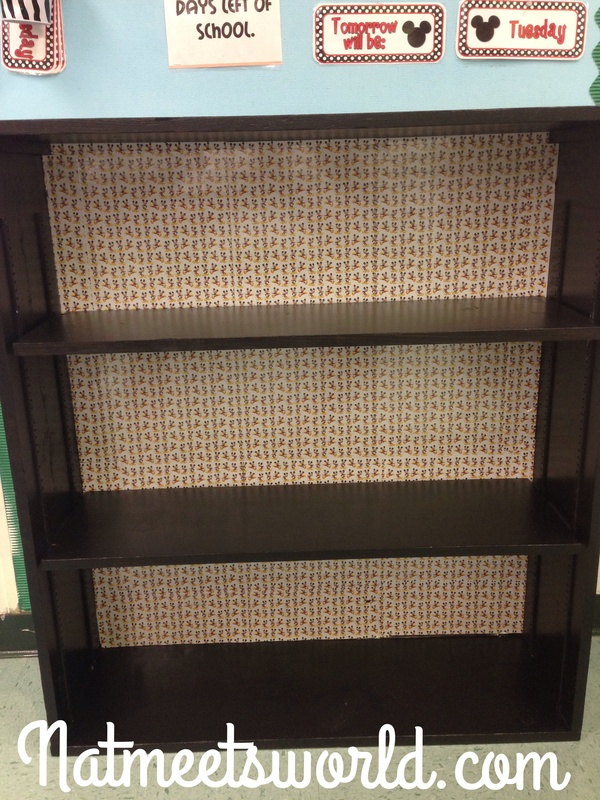 Cover the entire back of the bookshelf with a clear sealant paint or duct tape. 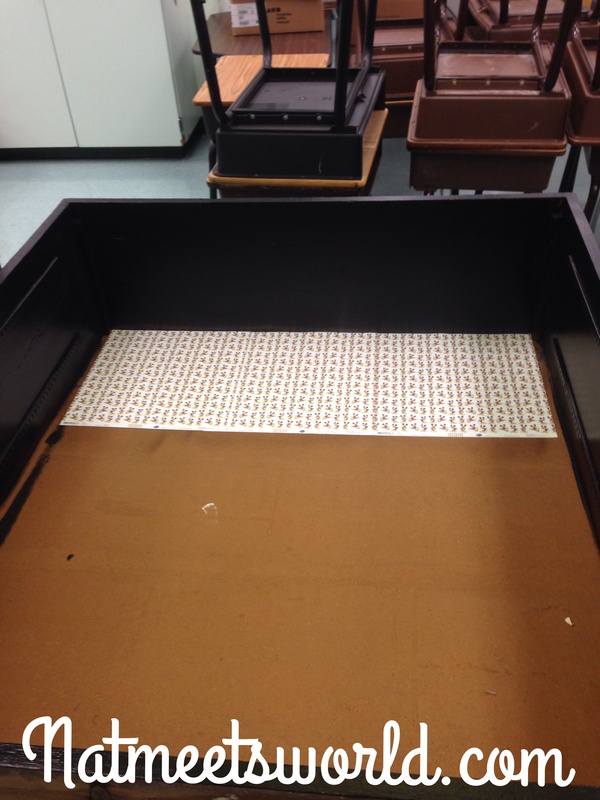 This will allow the back to stay durable as books are moved in and out. 6. Place the shelves back and you’re all done! 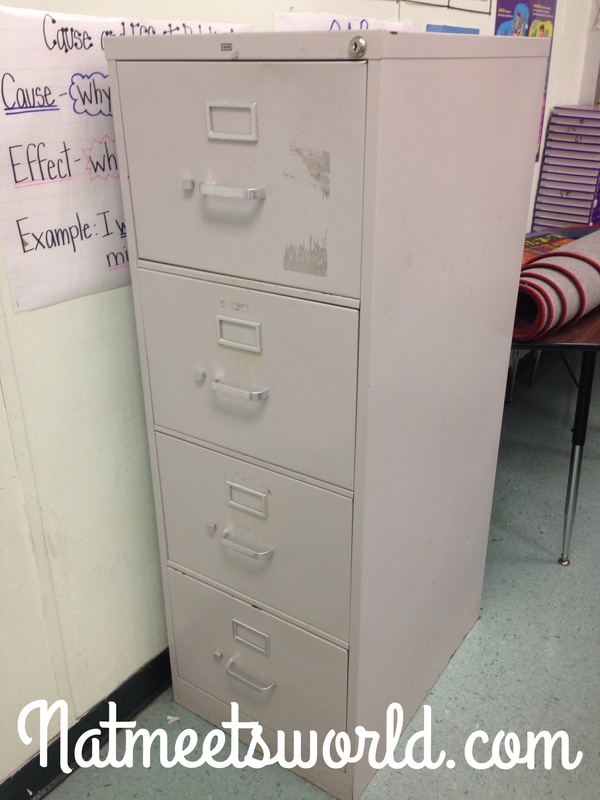 Now for the filing cabinet! 1. Remove all of the handles on the front of the cabinet. Wipe down clean with a baby wipe. 2. Use your 2-in-1 spray-paint/primer combo and spray it all over the book shelf. Spray a thin layer to avoid drips or clumps of paint to build. Let dry completely. 3. 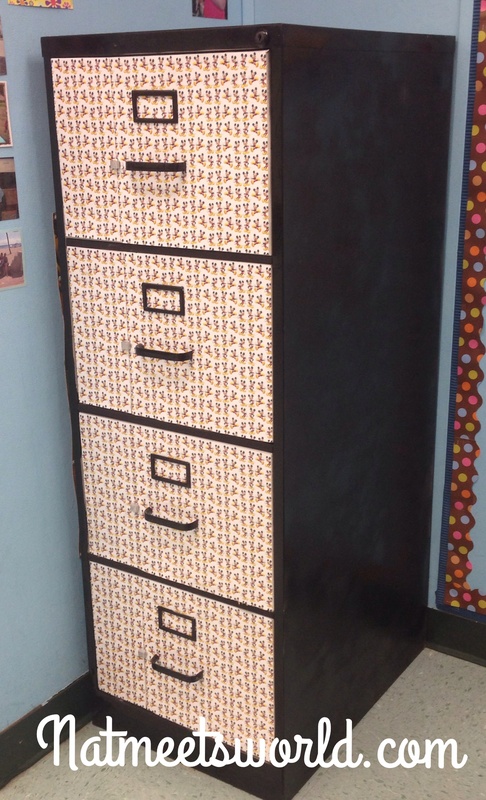 Use your spray-paint (without the primer) to give the filing cabinet a second coat. Let dry completely. 4. 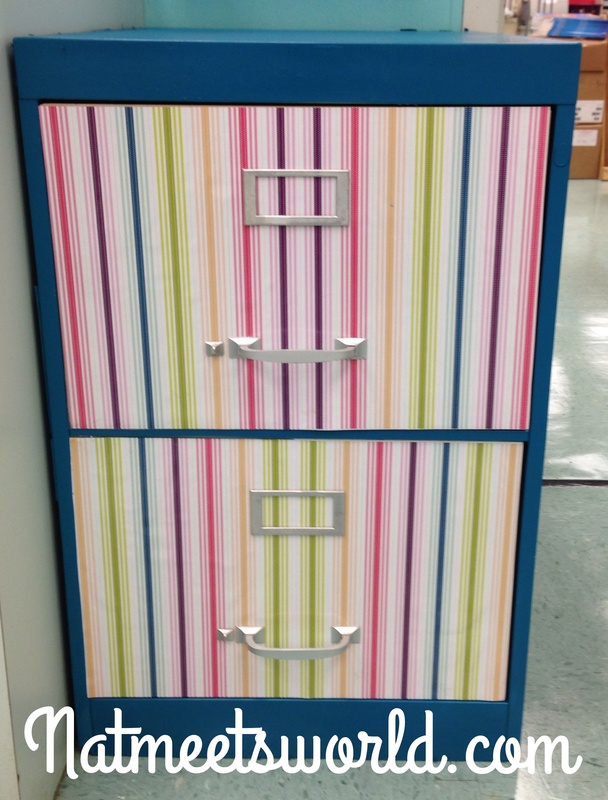 If you have a laminator, laminate your scrapbook paper before placing it on your filing cabinet. 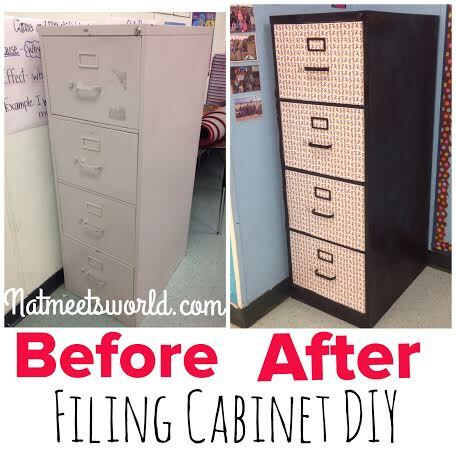 It will give your filing cabinet a nice, clean look. If not, skip this step and I will give you an alternative. 5. 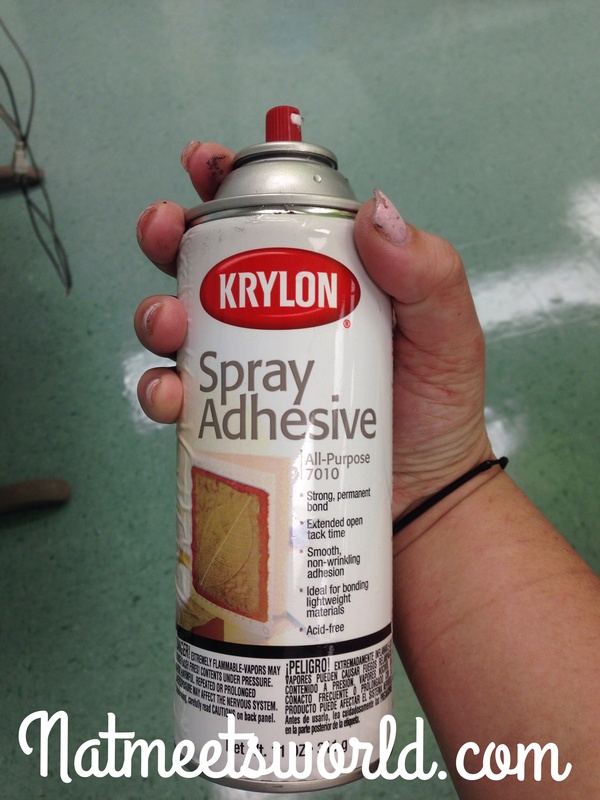 Use the Krylon adhesive spray to spray the front of your cabinet drawers. Press the scrapbook paper against the front of the cabinet drawer. Make sure there aren’t any air bubbles. Let dry completely. 6. If you did not have a laminator, use clear duct tape to seal the scrapbook paper on the front of the drawer. 7. Use an X-acto knife from the inside of the cabinet to cut out the sections of the paper that are covering the holes where the handles belong. Screw in the handles. 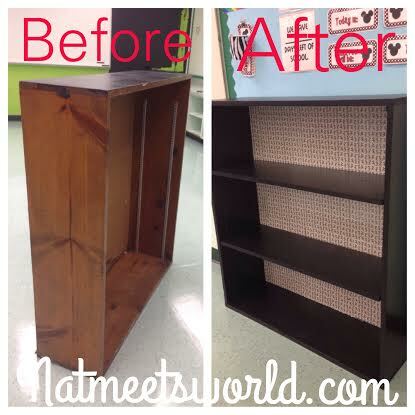 If you give your bookshelf or filing cabinet a makeover, I would love to see it! Comment below of you have any questions, or want to share your makeover!